There would be many agent computers in a company and it would be quite difficult to get information of each one or to control all the agents without computer management function. And sometimes we need to quickly check number of currently used license and the scope. Computer management helps IT management to better control computers within the whole network. Click menu Tools > Computers…, then the computers management window will show with the entire agent installed computers and their detailed information as the picture below. Administrators can delete or uninstall one or more agents to better manage the licenses. Click this button to delete needless agents. Deletion will uninstall the agent while reducing the number of license. Click this button to uninstall needless agents. Uninstallation will not reduce the license quantity. Administrators can quickly locate computer information needed based on the query conditions. All: Search all computers installed agent module by default. By IP address: Search agent computers by a specific IP range. By last appeared date: Set the date range and search agent computers if the last appeared date included in the range. Help to quickly search computers which do not appear for a period of time. By agent ID: Search computer by a unique agent ID. By name: Search computer by computer name. Support fuzzy query. Offline for days (>=): Search computers which have been offline for certain days. : This icon indicates that the computer license is authoried. Computers without this icon means outside the license range. Name: Computer name showed in console. ID: ID number of agent computers. Each computer gets an ID from server to be the only sign of that computer. IP Address: IP address of agent computers. 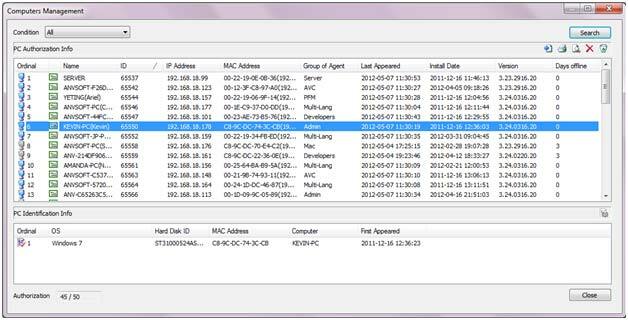 MAC Address: MAC address of agent computers. Group of Agent: Group of agent computers. Last Appeared: Last appeared date of agent computers. Version: Agent version information of monitored computers. Days Offline: Days offline of agent computers. Detailed information of specific PC includes OS, Hard Disk ID, MAC Address, Computer Name and First Appeared Time. Check purchased and currently used license quantity.